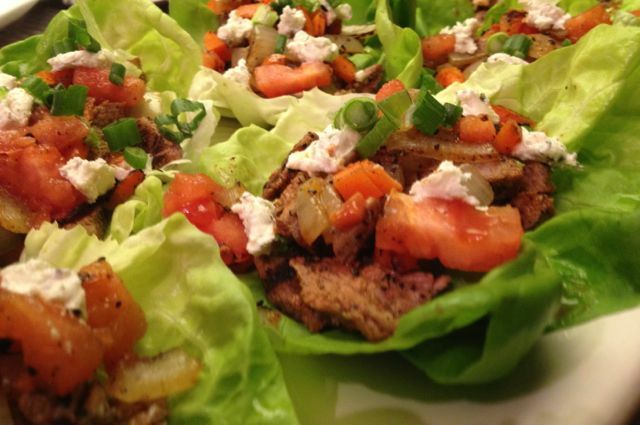 Grilled Steak Tacos in Butter Lettuce Cups, with Tomato, Onion, Red Pepper, Carrot and Goat Cheese. Happy National Taco Day, October 4th. Are you trying to eat healthy, but feel like you are stuck in a hard place between a Taco Truck and a BBQ Shack? Consider this recipe the Gluten Free (GF), grain free, good for you alternative. Though most Corn Tortillas are already GF, replacing them with Butter Lettuce is light, delicious twist. If you don’t have a Grill available, the main ingredients can be Pan Roasted or Broiled in the Oven. Not into the Meat thing? Feel free to substitute juicy Portobello Mushrooms or your favorite Vegan Meat Substitute. These are also great with Grilled Chicken Breast. 1. Chop Peppers and Tomatoes in half, removing seeds. Cut Onion and Carrot (lengthwise) into 3/4” slices. Rinse and Dry Steak, set aside. 2. Put Veggies and Meat in separate containers or foil pouches. Lightly coat with Olive Oil. Toss with Dry Rub, Cumin- Salt and Pepper (to taste). Be sure to finish Veggies, then the Meat. Try to marinate everything for at least 15 minutes to 1 hour before cooking. 3. Grill Steak 4-6 Minutes per side, depending on thickness. Grill Veggies for same amount of time (Note- Carrots may take longer cook time to tenderize). 4. Chop Veggies and Steak into 1” pieces. 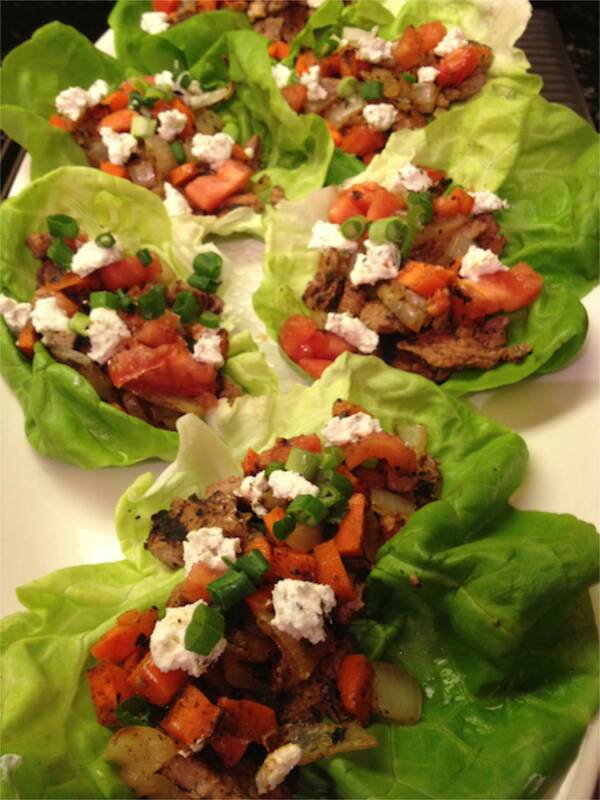 Place meat, then Veggies into individual Butter Lettuce Cups. Sprinkle a little extra rub on top, along with Chopped Green Scallions and Crumbled Goat Cheese (optional). These Tacos are great for a party first course or appetizer. As a main dish add more Meat or Grilled Avocados. It can also be served with Rice and/or Beans on the side. Go for the grain with Tortilla Chips or add colorful Veggie Chips (as a GF alternative). Of course, sprinkle the Chips with more delicious BBQ Rub and Enjoy! Here is closer view. Happy National Taco Day! Introducing POWER- a delicious BBQ Seasoning and Marinade; Gluten Free with 9 SuperFoods. See website for Recipes, including healthier homemade Gluten Free BBQ Sauce. Facebook- Daily Recipe Ideas and Updates. Twitter- Follow us on Twitter. Delightful alternate to the Taco Truck. Healthier and more flavorful too. Are you trying to eat healthy, but feel like you are stuck in a hard place between a Taco Truck and a BBQ Shack? Consider this recipe the gluten free (GF), grain free, good for you alternative. Many of us think of traditional Barbecue (or Barbeque) cuisine as being comprised of sweet heavy sauces, fatty meats and greasy side dishes… And we love all of it! However, nowadays more and more people are seeking healthier BBQ choices- for fitness, nutritional and medical benefits. Many chefs are now recommending that you use a dry BBQ Rub as a way to achieve bold flavor without all of the fat.